Ever since Samsung announced the 5.3-inch Galaxy Note phone/tablet, we've had a lot of fun coming up with endearing names for this "tweener" device. It's certainly an interesting device and North American customers can finally get their hands on it in the next few weeks. 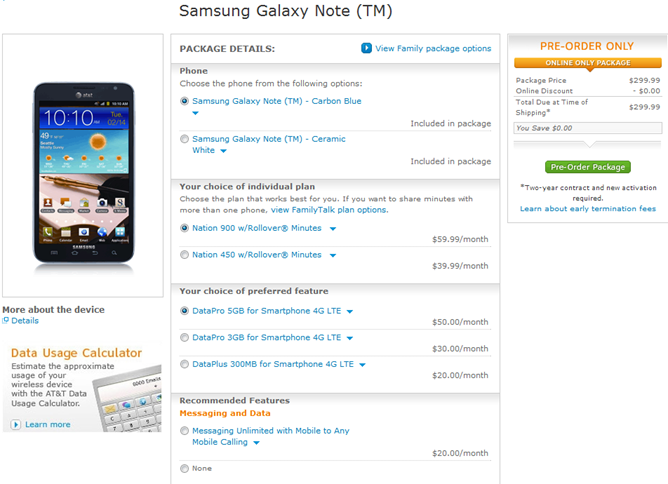 As promised by AT&T, the Galaxy Note is now officially available for pre-order from its website. Similarly, Best Buy US also has the Note up for pre-order in Carbon Blue and Ceramic White. Both Best Busy US and AT&T are offering the phablet for $299.99 with a minimum two-year monthly voice ($39.99/month) and data plan ($20/month). Unfortunately, it does not look like the subsidised device is available with a data-only plan. The device will start shipping from February 19th in the US and from February 14th in Canada. In Singapore I have seen many people carry around this device, and it is by far the best phablet available on the market today. It has a great screen, is reasonably powerful under the hood, and does a good job of combining a stylus with a capacitive touch screen.